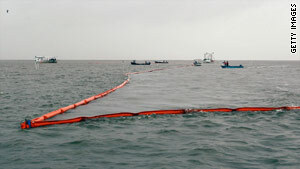 Workers place oil booms in the water to protect the coast line from the massive oil spill in the Gulf of Mexico. (CNN) -- Federal officials closed a portion of the northern Gulf of Mexico to fishing Sunday, curtailing a billion-dollar business as high winds and choppy seas hampered efforts to corral a rapidly growing oil spill. The spill cast a pall over the annual Blessing of the Fleet in Bayou La Batre, Alabama, one of many towns that make their living from the Gulf. In Venice, Louisiana, a rain-spattered President Obama told reporters his administration has launched a "relentless response" to the spill, but said the problem might not be solved for "many days." To the east, a heavy smell of oil hung over the Mississippi beaches, and the leading edge of the slick grew closer to the coast of Alabama and the Florida Panhandle. Adm. Thad Allen, the commandant of the Coast Guard, told CNN's "State of the Union" that the slick was still nine miles off the Louisiana coast, but seas of 6 to 10 feet have made deploying booms to fend the spill off the coast "somewhat problematic." Oil giant BP, which owns the well at the heart of the problem, said it had prepared massive boxes to be lowered over the leak points, but deploying them would take about a week. The minimum 10-day fishing restriction imposed Sunday by the National Oceanic and Atmospheric Administration covers an area between the mouth of the Mississippi River in Louisiana to the waters off Florida's Pensacola Bay. The Gulf Coast's commercial fishing industry brings in about $2.4 billion to the region. Thomas Rodi, the Roman Catholic archbishop of Mobile, officiated at Sunday's event in Bayou La Batre and said the spill could have "widespread effects" on the area -- "not only the livelihood of people, but an entire way of life." Among those taking part in the blessing was Maurice Ryan, who told CNN, "You have to put your trust in someone." "This event is a self-feeding fire," said Richard Charter, of the environmental group Defenders of Wildlife. "It is so big and expanding so fast that it's pretty much beyond human response that can be effective." 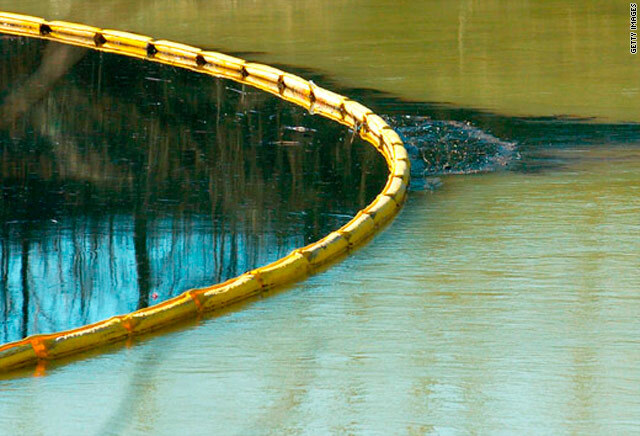 The spill will have "a multidecade impact" -- a "long-term poisoning" of the area, he said. Booms were strung across the mouths of delta estuaries in Louisiana and inlets along the Mississippi coast. In Alabama, National Guard troops helped lay them out off Dauphin Island, at the southern end of Mobile Bay. "All I know is seafood," he said while sorting crawfish in small workroom behind the kitchen. "I don't know what we'll do if this hits. It feels like a hurricane is coming, but what can you do to stop oil?" The cause of the blast on the Deepwater Horizon remains unknown. BP says a device known as a "blowout preventer" failed and has not responded to repeated attempts to activate it using remotely operated submarines. 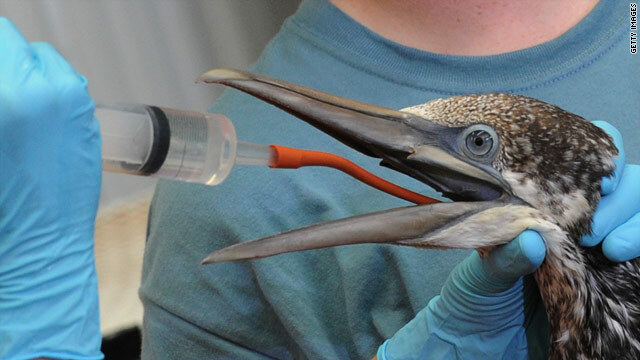 Frustration with BP was growing across the Gulf states, and Louisiana Gov. Bobby Jindal said Saturday that the company's response has been inadequate. But BP America's president, Lamar McKay, told ABC's "This Week" that its focus "is dealing with the source of the oil, dealing with it on the surface, and dealing with it on the beach or the marsh if it occurs." BP spokeswoman Marti Powers said the company is still trying to use remote-controlled submarines to shut off the well at the ocean floor, about 5,000 feet below the surface, and spreading dispersants on and under the water to break up the slick. The company has put out about 300,000 feet -- roughly 60 miles -- of floating booms to keep the oil away from ecologically sensitive shorelines, she said. But she said efforts to skim oil off the surface were put off because of bad weather. CNN's Brian Todd, Sarah Hoye, Mark Biello and Richard Lui contributed to this report.